Israeli officials applaud selection of former US Ambassador to the UN John Bolton for National Security Advisor. On Thursday, President Donald Trump announced via Twitter that National Security Advisor H.R. McMaster would be replaced next month with former Ambassador John Bolton. 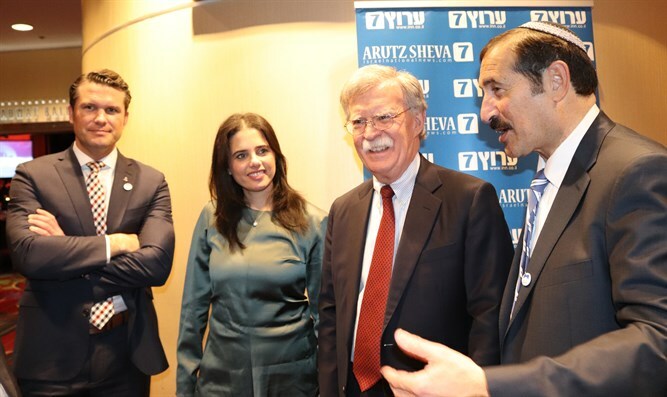 On Friday, Justice Minister Ayelet Shaked (Jewish Home) congratulated Bolton on the appointment, hailing the former ambassador as a ‘true friend of Israel’, and said the move showed the Trump administration backed the Jewish state. “President Trump continues to appoint true friends of Israel to senior positions,” the Justice Minister said Friday morning. Education Minister and Jewish Home chief Naftali Bennett tweeted his support for Bolton's appointment, writing "Great appointment of Amb. John Bolton, an extraordinary security expert, experienced diplomat and a stalwart friend of Israel. Good luck John!" Bolton, a long-time supporter of Israel, criticized the signing of the 2015 Joint Comprehensive Plan of Action (JCPOA) with Iran and has lobbied for the US to abandon the agreement since. The former ambassador last year declared the two-state solution dead, and slammed Palestinian Authority chief Mahmoud Abbas as having 'no legitimacy'. “We have reached the end of the illusion that began in 1964 with the establishment of the PLO, which created a feeling that it is the Palestinian alternative, and the issue here is not in the borders but in the nature of the state that will be alongside Israel which will be a state of terror, so it should not be," Bolton said during a 2017 ceremony marking the 50th anniversary of the reunification of Jerusalem.